Many of you all know about our active neutering campaign and our monthly “snip and chip” events, of which could not be run without our dedicated neutering co-ordinator Linda Holland who works tirelessly issuing neutering vouchers along with educating/promoting the importance of the need to attract the owners to get their cats neutered before they start breeding again. Linda has been a Cats Protection volunteer for Anglia Coastal since our branch was established in September 2015 and previously Waveney branch for over 25 years. 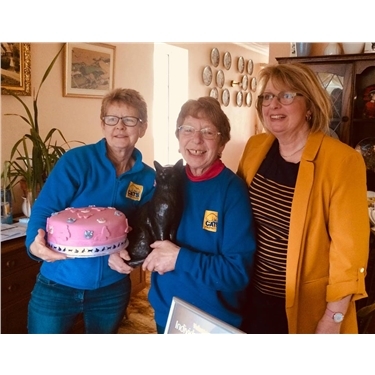 To celebrate Linda’s hard work at our recent committee meeting our Regional Branch Manager Lin Lockwood and our Branch Coordinator Christine Cutts presented Linda with a lovely bronze statue, certificate and a celebration cake. Christine said “Linda is one of a kind her role is an important part of our branch, and when Waveney closed as a re-homing branch, Linda carried on the role issuing the vouchers until our new branch Anglia Coastal was established. Cats Protection and all the cats in our area will always be grateful for all her dedication”.